The SNP MSP said “extreme Brexiteer” Mr Francois’ remarks – about not submitting to “German bullying” because his D-Day veteran father did not either – should be condemned. 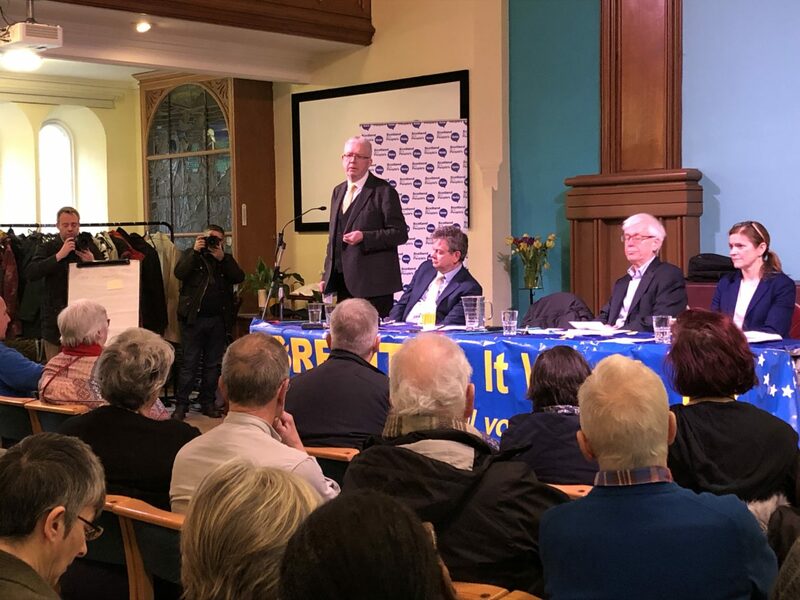 Mr Russell was speaking at a People’s Vote rally in Edinburgh, and told the audience of around 150 about his own father, who was injured during the Second World War. He said: “At the age of 19 he volunteered… (He) was a sergeant at Dunkirk and had a bullet through his knee. And I think if there was one thing that he believed that he could achieve it was that his 19-year-old son would never go through that experience, just as my 19-year-old son will never go through that experience. “Mark Francois’ remarks were obscene. They were wrong. They should be condemned. We should remember that is what we are up against. Mr Russell also said there is viable potential to hold another referendum before Britain leaves the European Union on March 29 – if work begins as soon as possible and the options of ruling out a no-deal or extending Article 50 are not taken. He said the latter would complicate matters further because of the upcoming European elections. Mr Russell added: “I spend about half to three-quarters of my time working on issues of a no-deal Brexit and it is literally unthinkable that we would find ourselves in those circumstances. “And contrary to what the Prime Minister says, a no-deal Brexit can be ruled out with a vote in the House of Commons and the stroke of a pen. “If the elected representatives of the people cannot in the end find the solution, how do you get a solution except by returning to the people? “And you return to the people either in an election, or you return to the people by means of a referendum. That is where we are now. Sir Anton Muscatelli, principal at Glasgow University, also spoke at the event and remarked on how Brexit would impact upon the Erasmus programme. The academic revealed the institute could lose around 12% of funding through a lack of uptake in the scheme because of the border difficulties in the event of a no-deal Brexit. Speaking in a personal capacity as an economist, Sir Anton told the audience: “Young people at my university keep telling me how much they value their feeling, that they belong to a common European home. “Where being a citizen of an EU country does mean being a citizen of somewhere. It means feeling proud of your national identity whilst still feeling that you belong everywhere in Europe. “In contrast, the Prime Minister’s misplaced thesis is about being a citizen of everywhere in Europe, not a citizen of nowhere. A few months ago, he called Brexit was “the most unhinged example of national self-sabotage in living memory”. On Saturday, Sir Anton added: “The people advocating (a no-deal Brexit) are modern day alchemists trying their base to turn metal into gold. But we all know where that ends up. “Base metal doesn’t turn to gold, Brexit isn’t going to turn into anything less than an unmitigated disaster – regardless of any imagined deal which provides all the benefits of the single market with none of the obligations. “The UK faces an unprecedented political crisis and the only people who can get us out of this mess are the people by voting again. Also on the panel was Catherine Stihler MEP, who is standing down from her position before Brexit and the next election to join a data-sharing initiative. The Labour representative said: “The first thing I ever worked upon was to battle labelling, to put graphic warnings on cigarette packets. “You might not think that’s a big issue but when you think about the fact we could regulate at a European level over 300 million people to create one rule rather than 15-20 different countries, you could never have done that if it hadn’t been for us working together. “I feel very proud that I instigated that and we’ve led in Scotland with tobacco legislation. We also didn’t have braille on pharmaceutical packaging. People from the industry said if it hadn’t been for that amendment or work we would never have done it. That makes such a difference across the whole of the EU.